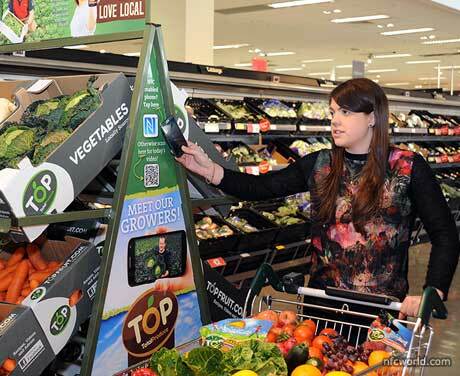 International fresh produce distributor Total Produce is to provide consumers with access to videos, recipes, interactive games and content about the benefits of a healthy, balanced diet via NFC tag and QR code-equipped SmartStands located in supermarkets and convenience stores. ‘Fresh n Ready’ stands are placed in convenience stores and are aimed at busy consumers “on the go”. These SmartStands will link to video recipes, updated daily. ‘Love Local’ stands promote local produce and feature short videos about individual growers, allowing shoppers to take a virtual tour of their farms on their mobile device. Bluetooth Low Energy (BLE) beacons are also being tested and Total Produce plans to introduce SmartStands that combine NFC, QR and BLE by this summer. “We can upload a new video to these units instantly to respond to opportunities; a barbecue-themed video on a sunny afternoon, a pumpkin carving video for Halloween or a recipe video to complement an in-store price promotion,” says Vince Dolan, European marketing manager at Total Produce. “Similarly, we can update grower videos to reflect changes in product range at any time. Excellent NFC campaign delivery encouraging the consumer to engage with the product, well done to Rupert at Wooshping! Please note the use of the recognisable NFC forum logo for the tapping point. it may look or appear similar to a number of other logos, but used correctly in blue, it stands out loud and clear. This is a clear indication of how consumers can build on their product knowledge, retailers can up sell by including recipe add ons, and build loyalty by offering discounts. Nice one Rupert. Will be mentioning this at WIMA next week.